You nearly didn't get to see this Bad Lip Reading of Star Wars The Force Awakens from their Bad Lip Reading YouTube channel which, if you know the drill, takes Star Wars movies, TV shows, the NFL, presidential debates, inaugurations, and more, and redubs over them with some terrible, yet hilariously surreal, lip reading. The guy behind it likes to remain anonymous, although it's thought he's in the music production business. His latest effort is a thoroughly entertaining reworking of The Force Awakens. Somehow he even manages to get Mark Hamill on board for his latest creation to guest star as Han Solo. And it's a near perfect impression. The video begins with Rey knocking Finn to the ground while BB-8, now known as Ricky the demon machine, zaps Finn and tells him to shut up, while speaking in a deep, gruffly voice. After that we see Han and Leia have some strange conversations about monkeys, fraps, and kittens in bags of water. Then the Bad Lip Reading also gives us Chewbacca flirting with a doctor, and Kylo Ren listening to some records while quoting The Silence of the Lambs at Rey. There's also Han and Finn arguing about ninjas and Kylo Ren telling Supreme Leader Snoke that he can see his gonads. Finally, we get Han confronting Kylo Ren on the bridge in the now iconic scene. 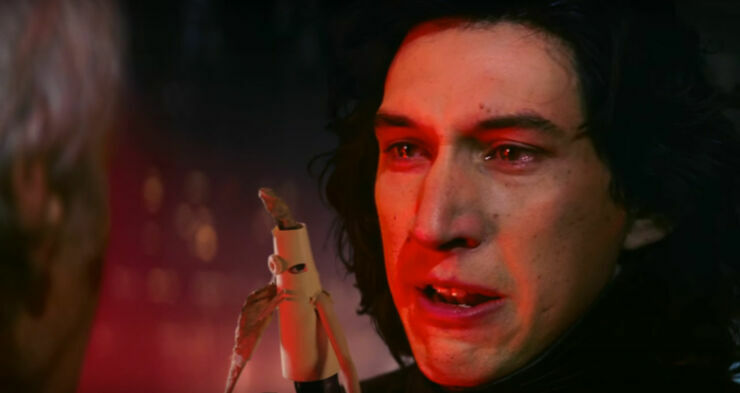 But in the Bad Lip Reading version of this tense showdown, Kylo Ren reveals...dun...dun...dun...an unpainted finger puppet. Which clearly upsets Chewie, Finn, and Rey no end. It's all very, very funny, and you'll be glad that you're now able to finally watch it after a brief, and erroneous, interlude due to it being removed from Youtube for a few days. After the video was initially uploaded to Youtube on 6 April 2017 it started trending big time, but then it was suddenly taken down by YouTube due to a copyright claim by Dramatists Play Service, who are based in New York and publish and license plays by playwrights. Although, strangely they denied that they'd made the claim. “The people who made the claim (Dramatists Play Service) have zero grounds and one can’t help but assume it was done maliciously." Bad Lip Reading had told Variety in an email. After the video was uploaded it was riding high on 1.37 million views before it was taken down in error. Fortunately it was then reinstated 15 hours after it was initially uploaded and is now on over 3.1 million views. And we can all finally watch it. It seems it was a victim of what some claim is YouTube's draconian copyright infringement policy. Or maybe the dark side had something to do with it's removal? Or Youtube IS the dark side? Perhaps a review might be in order.